From the purchase of S-400 air defence systems to INS Arihant completing its first deterrence patrol, 2018 was an important year for India. There are several defence related developments which are worth recalling now that the year is coming to an end. In October this year, India signed the much-anticipated deal worth $5.43-billion (around (Rs. 39,000 crore) to buy five Russian S-400 Triumf air defence systems. The Triumf missile deal with Russia will give the military a much-needed boost, which would act as a deterrent against China’s growing presence in the region and a superior edge over Pakistan. The S-400 Triumf missiles are extremely efficient to track and hunt down combat aircraft, even stealth planes, at unprecedented ranges. Each system of S-400 includes a command and control centre, a 3D phased array acquisition radar, optional tracking radar and firing units with associated multi-mode engagement radar. The acquisition radar can not only detect and track up to 300 targets within a distance of 600km, but can also engage 36 targets at one point. country with nuclear weapons. The ability to fire nuclear missiles from under the sea — an ability that Arihant has — is particularly important because submarines, unlike fighter aircraft and land-based missile systems, are harder to track and destroy. In September this year, India and United States signed Communications Compatibility and Security Agreement (COMCASA) that will lead to a new generation of bilateral military partnership. It was signed at end of inaugural India-US ‘2+2’ Ministerial Dialogue held in New Delhi. COMCASA is one of the four foundational agreements that the U.S. signs with allies and close partners to facilitate interoperability between militaries and sale of high end technology. COMCASA is an India-specific version of the Communication and Information on Security Memorandum of Agreement (CISMOA). It comes into force immediately, and is valid for a period 10 years. COMCASA allows India to procure transfer specialised equipment for encrypted communications for US origin military platforms like the C-17, C-130 and P-8Is. Currently, these platforms use commercially available communication systems. The Indian Army on November 9 inducted three major artillery gun systems, including the M777 A2 Ultra Light Howitzers, K-9 Vajra self-propelled gun and a ‘Composite Gun Towing Vehicle’. the Indian Army on Friday (November 9) inducted three major artillery gun systems, including the M777 A2 Ultra Light Howitzers, K-9 Vajra self-propelled gun and a ‘Composite Gun Towing Vehicle’. The 155mm, 39 calibre Ultra light Howitzers have been procured from USA under Government to Government Foreign Military Sales and will be assembled in India by BAE Systems in partnership with Mahindra Defence. The first ten K9 Vajra 155mm/52 calibre guns have been imported from Hanwha Techwin of South Korea in semi-knocked down state and have been assembled by L&T in India. The K9 VAJRA-T 155mm/ 52 is a tracked self-propelled howitzer, which has its roots in the K9 Thunder, the mainstay of the South Korean Army. The Vajra offers a high rate of fire at a long range and is compatible with Indian and standard NATO ammunition. In September, India successfully conducted interceptor missile test off the Odisha coast at night. With this, Defence Research and Development Organization achieved major milestone in developing indigenous two-layer Ballistic Missile Defence system. PDV interceptor missile was launched from Abdul Kalam Island (earlier known as Wheeler Island) of the Integrated Test Range (ITR) off Odisha coast. 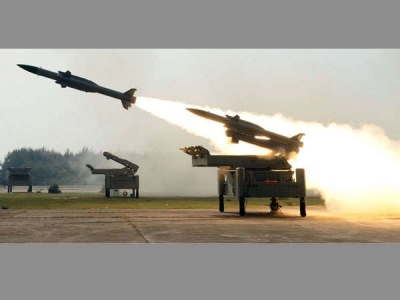 Its mission was aimed at test-firing of interceptor missile of coast of Odisha to intercept an incoming ballistic missile off the Bay of Bengal During the test, both PDV interceptor and target missile were successfully engaged in automated operation. In this operation mode, the radar-based detection and tracking system of missile system detected and tracked target ballistic missile. In January this year, the Defence Ministry approved procurement of P-8I Training Solution for Indian Navy and Low Intensity Conflict Electronic Warfare System (LICEWS) for Indian Army at total cost of Rs 2419.32 crore. The P-8I Training Solution accurately simulates P-8I aircraft and mission systems. It will help Indian Navy train and realistically rehearse for sophisticated missions involving P-8I aircraft, at a fraction of the cost of live aircraft training. The first P-8I aircraft was inducted in Indian Navy in 2013 and as of date, eight aircraft, based at INS Rajali, have been fully integrated into operations. In 2016, the Ministry placed a follow-on order for four additional P-8I, the delivery of which will begin in 2020. LICEWS will equip Indian Army with upgraded communications infrastructure that will help forces to effectively deal with advanced communications systems being used by terrorist groups. The first ever mid-air refuelling of the indigenously developed light combat aircraft Tejas was successfully carried out in September this year. The milestone was achieved when 1,900 kg of fuel was transferred from the mid-air refuelling tanker of IAF’s IL78 to the Tejas LSP8 at an altitude of 20,000 feet, which has developed the light combat aircraft (LCA). With this, India joined in elite group of countries which have successfully developed air-to-air refuelling system for military aircraft. After a series of delays, Russia has been declared the lowest bidder in the Army’s multi-billion dollar deal for man portable air defence systems (MANPADS). The Russian Igla-S system is expected to replace the IGLA M systems of Russia that is being used since the 1980s. The deal is valued at $1.5 bln with the Russian bid considerably undercutting offers by Sweden’s SAAB RBS70 NG and France’s MBDA Mistral. After five years of rigorous trials, Igla-S system fielded by Rosoboronexport emerged as the best system for the Indian Army. Defence Research and Development Organisation (DRDO) conducted first successful trials of indigenously developed third generation Man Portable Anti-Tank Guided Missile (MPATGM). Two rounds of missile were flight tested in operational configuration in two days from Ahmednagar range in Maharashtra. tracked target all through its trajectory and destroyed it with high precision. The missile performed as expected during the test by meeting all mission objectives successfully and validated its maximum range capability. Apart from stand alone and warhead testing, the missile also had undergone series of tests including integrated static trial to characterise trust vector control. In August this year, Defence Acquisition Council (DAC) approved procurement of 150 indigenously designed and developed 155 mm Advanced Towed Artillery Gun Systems for Indian Army at approximate cost of Rs 3,364.78 crores. This procurement will further quest for modernisation of Armed forces. These guns have been indigenously designed & developed by Defence Research and Development Organisation (DRDO). They will be manufactured by production agencies as nominated by DRDO.